A nagging thought creeps up on you frequently while listening to John Frusciante's debut album as Trickfinger: that perhaps you've heard these tracks somewhere before. You haven't, of course—Trickfinger is a new LP of original material from the multi-faceted artist (and former Red Hot Chili Peppers guitarist). But it's also an album made up entirely of hardware-built acid house. Richard D. James' AFX records—or, rather, much of the Rephlex catalogue in general—seems to form Frusciante's roadmap, and he follows their directions closely. Very little of Trickfinger could be called surprising, but it isn't without its charms. None of the eight productions on this album challenge the fundamentals of acid house, but they do harness its inherent qualities with style. 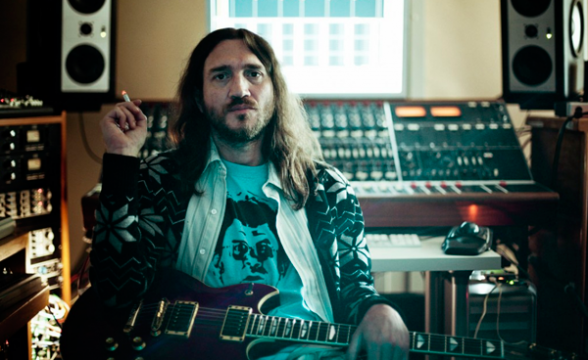 In the same way that AFX utilizes dissonance and Last Step (AKA Venetian Snares) is steeped in loopy delirium, Frusciante uses harmony and rhythmic complexity to give his music definition. Something like "Sain," with its pointillist drum sequences and untethered 303s, finds fresh excitement in acid's natural proclivity for twitchy, evasive movements. "Rainover" snakes through a labyrinthian seven minutes, folding together slippery time signatures. Frusciante's tricks make more of a lasting impact when he pushes his machines toward their limit. But sometimes the overdose of signifiers is debilitating—for instance, on "Exlam," with its convoluted synth patterns, bleepy timbres and hard-smacking drums. The bullish "Phurip" takes a stronger swing at club-ready acid heat; its bass-heavy arrangement swaggers with excitement, sounding not unlike a Luke Vibert highlight. Frusciante does little to develop the already potent machine-funk here, which seems to be a missed opportunity for a gargantuan album closer. But Trickfinger has no lack of solid ideas and sly hardware manipulations. That a relative newcomer to the field could do as much on such well-trodden ground bodes well for Frusciante's future as an electronic producer. To pre-order it on double vinyl, CLICK HERE.